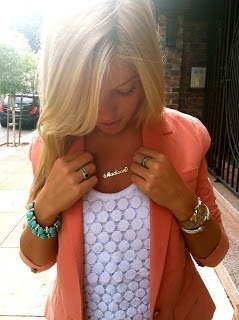 I flipped the coral blazer for a white one, a white top for a coral/pink one, and put the pop of turquoise on my neck. You guys, I didn't look through my pictures after they were taken and this is the only one that turned out! Ugh. So frustrating when that happens. Anyway, I found this top in the clearance section at Target this past week! Some lights it looks coral and others pink. But it's such a fun, Springy color and I love how the material almost has a crocheted look to it.Maybe if I keep wearing Spring colors, it will finally arrive here in MN! It is definitely NOT Spring here in Albania here. And Spring looks so far away if you saw the weather lol. We have had such a crappy, cold April. Anyway, you look great. I love the pin, but I also love your creation. The turquoise necklace definitely pops against the pretty coral. Love both the top and coral by the way. I am wearing a Lace Top today myself. Come link up with me - I am co-hosting. Thanks. Thanks Ada! We used to have nice April's, but the last few years have been cold and blah. I saw a 70 degree day forecasted for next week though! You keep inspiring me to pull out my white blazer! I have a very similar, if not the exact same one, that you do, that I bought way back in 2007. You've done so many cute outfits with it. Thank you! It really is quite a versatile blazer for spring! Great outfit!!!! Loving the white blazer---I keep seeing them everywhere, def going to have to pick one up!! At least this picture turned out cute :) I end up taking like 15 to 20 in hopes I get 5 I like. 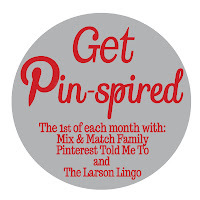 I love that you flipped the two colors - that is such a good way to recreate a pin. I always think I can't recreate something because I don't have the exact pieces... I need to think like you do! I'm so into coral and turquoise right now! Love that you are wearing Spring colors even though it's not as "Spring-y" at your area yet. I should wear Spring colors since I live in South California! Fail! Love your look! And so now I need a white blazer!!! This is really cute top. I find that a lot of my coral pieces photograph more pink too. I like how you took inspiration from the pin and made it your own!